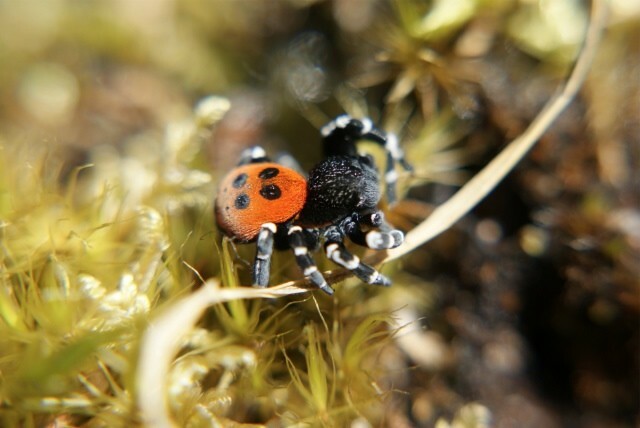 The Ladybird Spider Eresus cinnaberinus — so called for its bright red body covered in black spots — was on the brink of extinction in the mid-1990s when a single colony of just 56 individuals was left in the UK. Since then conservationists have been helping it to spread further afield — and today [Thursday 11th August] it is to be released into one of the most diverse insect and spider habitats in the country at the RSPB's Arne reserve in Dorset. The aptly named Ladybird Spider (Ian Hughes). And scientists have come up with an ingenious low-tech method of transferring the spiders. They are using empty plastic mineral water bottles, which are an ideal shape and size for the spiders to make their nests in. The bottles were filled with heather and moss and captured spiders from the donor site were placed inside and monitored while they settled in and made a web. The bottles will now be buried in holes in the ground at Arne so that the spiders can colonise the nearby area. The spiders will be another piece of the invertebrate jigsaw for the Arne reserve, which is already home to a host of rare insect and spider species. The heathland site boasts 240 species of spider and hundreds of insect species including the threatened Silver-studded Blue butterfly and the Roesel's Bush Cricket, which was discovered on the site last year. Toby Branston, RSPB Arne warden, said: "Arne is an amazing place for bugs and this is the best time of year to see and hear them. To be introducing such a rare new species here is very exciting, and I hope we can help it to spread further. The most striking thing about the Ladybird Spider is the unique colourful markings on the male which give it its name, but it also leads a fascinating lifestyle. They spend most of their time underground where they create silk canopies which they decorate with the remains of beetles, ants and other spiders they have eaten." "Burying plastic bottles in the heathland may seem a little strange to some of our visitors, but the experts have found that this is the best way to translocate the spiders. This is an ideal habitat for them so we will be keeping a close eye on the new colony and carrying out regular surveys to see if they take to their new home." 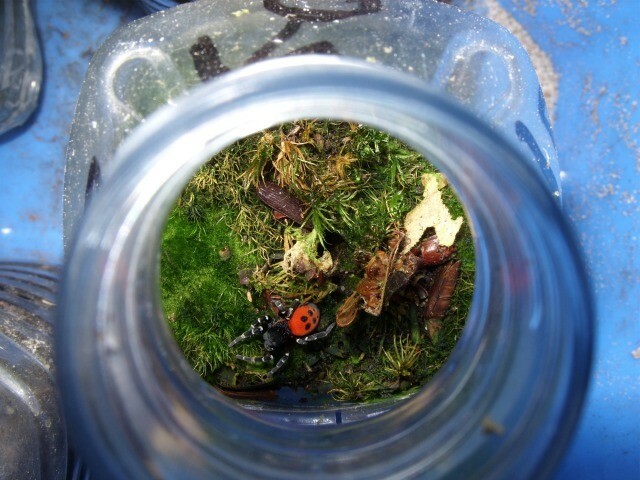 A Ladybird Spider in its temporary bottle home (Ian Hughes). For many years scientists believed that Ladybird Spiders were extinct in the UK, but a colony was discovered clinging on in the 1980s. It is a heathland specialist and has suffered over the years from the destruction of much of our wildlife-rich heathland habitat. More than 90% of our lowland heathland has been lost to agriculture, commercial forestry and development, putting major pressure on the species that rely on it. As well as insects and spiders, heathland is also home to endangered reptiles such as Smooth Snakes and Sand Lizards, and birds such as the Dartford Warbler and the Nightjar. There will be a chance to see the reintroduction site as well as spot some of Arne's fascinating insect and arachnid species on one of two organised spider walks at the reserve. The events take place on Sunday 14th August and Sunday 25th September. For more information, visit the Spider Sunday web page.